Even in these days of Google, Bing, and search engine optimization, there’s still a place for a really good curated link site. Not only can they pull together the best-of-the-best, but they can also highlight the gems that otherwise would have remained hidden. For genealogy, my “go to” link site is Linkpendium. A very small section of the Washington County, Pennsylvania page on Linkpendium. It has the usual suspects, such as databases on Ancestry and FamilySearch. But it also has those wonderful hidden resources that we’re always hoping to find. Things like “Telephone Directory of Bellaire, Bridgeport, Martins Ferry, St. Clairsville, Ohio, 1934” and “Livingston’s Law Register, 1851.” Sure, I might have found those in a Google search… had I known they existed or thought to look for such a thing. Be sure to go through the surname pages on Linkpendium. Not only do they have links to websites and blogs about specific surnames, but also links to sources you should be checking out anyway, like the RootsWeb mailing lists and WorldCat. It makes for a very convenient way to cover all of those bases. Part of the DeBolt page on Linkpendium. 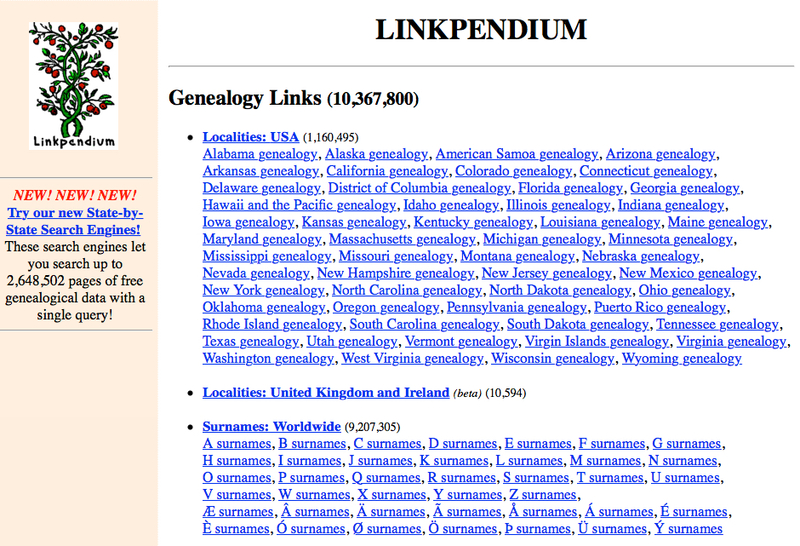 As if having more than 10 million links wasn’t enough, Linkpendium also has a genealogy search engine that covers 2.6 million web pages. (Those aren’t just any ol’ web pages. 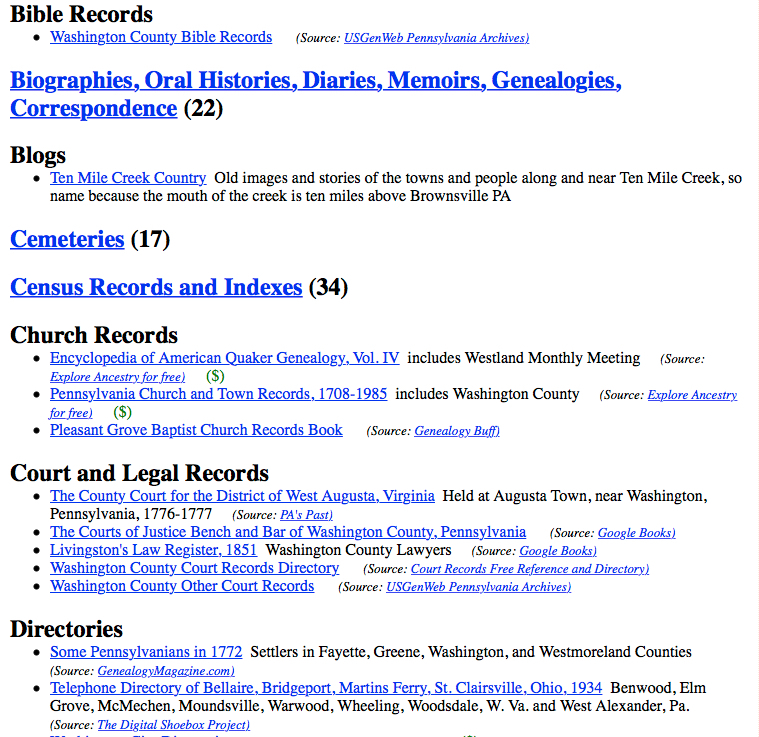 Those are web pages that have genealogical information.) On the Linkpendium home page, click the link on the left side of the page that says “Try our new state-by-state search engines.” On other Linkpendium pages, look on the right side of the page. You can search the entire United States or narrow it to just one state. Search by full names or just the surname. I have noticed that if you’re looking for two surnames on the same page, it’s best to do two searches: once with the quotes and once without. Links sometimes die. The link above for the Labette County, Kansas history is no longer working. But I can see a saved version of the page by clicking on “cached.” Though the links on that page no longer work, I can see that there are several Debolts in History of Labette County, Kansas and its Representative Citizens, ed. & comp. by Hon. Nelson Case. Pub. by Biographical Publishing Co., Chicago, Ill. 1901. I can go look for that book on Google Books and WorldCat. 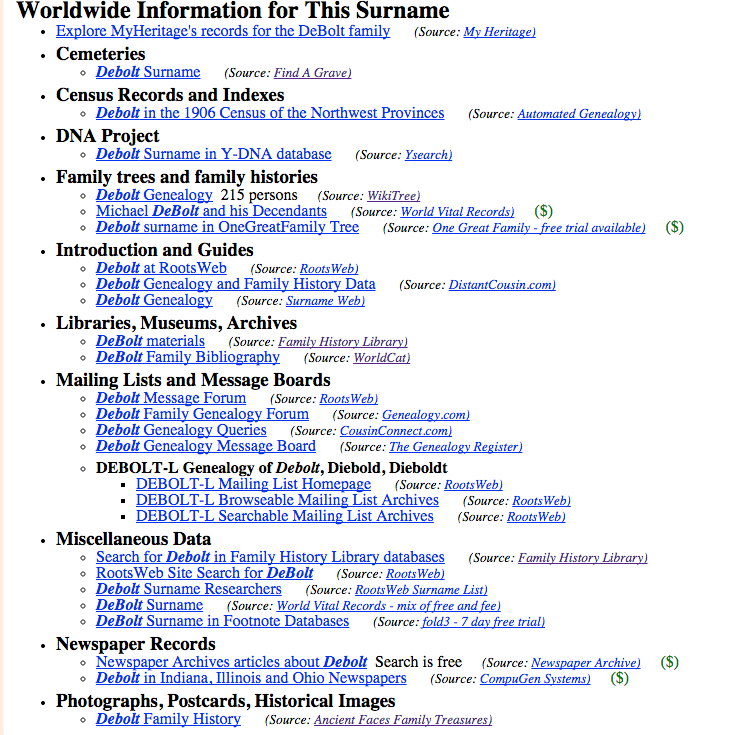 A curated list of more than 10 million genealogy links should get our attention! 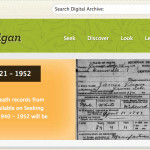 Linkpendium provides genealogists with a convenient way to find sources applicable to their research. Even if you don’t use the link section of Linkpendium, run some searches in the search engine. You never know what you might turn up! Since ancestry took over Rootsweb it has been more and more difficult for me to access my own web page on rootsweb along with the surname and placename lists. Back in the day the contacts made through rootsweb were great. I previouly did random acts of genealogical kindness through rootsweb, something that I enjoyed and would love to get back to. I am glad to see information on this site so that I can reconnect on some of the lists. I believe the correlation of the acquisition of rootsweb by ancestry is directly related to the lack of use on these sites and lists, when I looked at the archives for my interest lists there have been fewer and fewer, starting about 2003. And as you noted some links have died over time. Amy – thanks for this fabulous tip. You’re welcome! I hope you find lots of good sites! 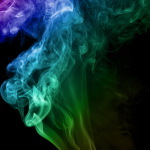 Hi Amy, Learn something new from you all the time. I had this site bookmarked but had forgotten how resource rich it really is. Thanks! 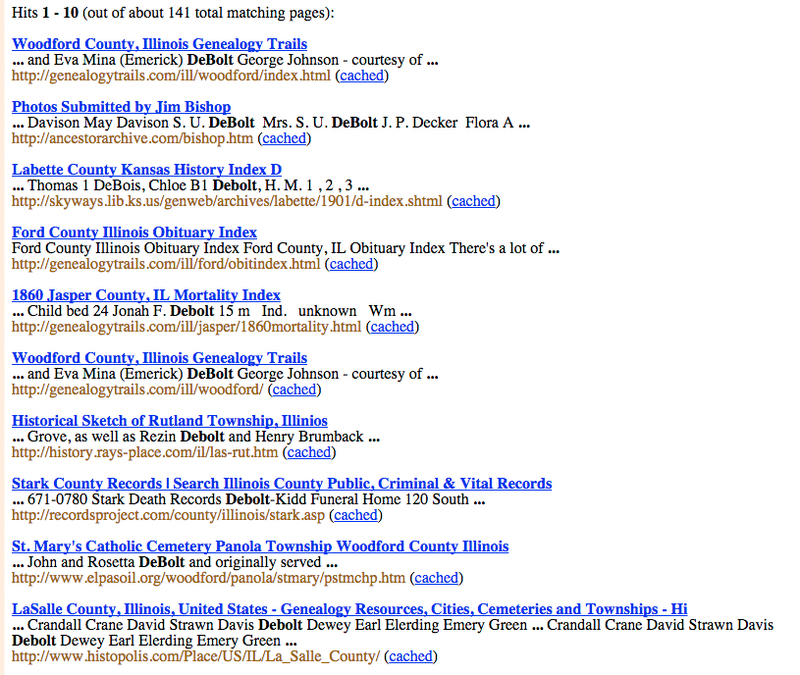 I always look for linkpendium link when researching in a new county. Love it! thanks Amy for this site info, I am looking forward to using it. I also receive your email, which has been a great help to me. i belong to Ancestry, but their new format has completely messed up some of my families. i have 30 generations on one side and they just wiped it out, I have it all, but it is really confusing and I have told them so. I am writing a history for my children and at 81, I just don’t like being messed with.